Whether you love traveling around the world or taking an occasional weekend getaway out of state, you never want to leave your home unprotected. 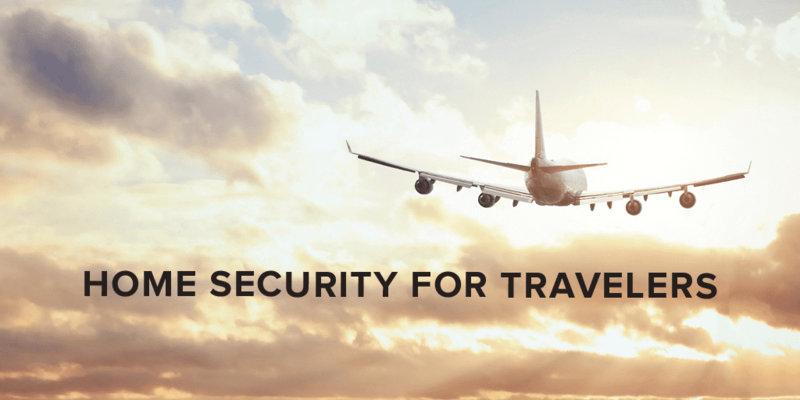 Fortunately, with the help of a monitored home security system, you can travel to faraway places without worrying that your property will be vulnerable in your absence. Not all security plans are created equal, however. Having professional monitoring protection 24/7 when you’re traveling should be your first priority, but picking features beyond constant monitoring can be tricky. Here are a few tips for choosing security options — along with a look at which popular monitored home security companies offer those features — to help you better understand how to keep your home safe no matter where you are. Smartphone technology has revolutionized the home security industry. Mobile phones are no longer useful just for text alerts or phone calls — they can now also give you immediate access to live security camera feeds, as well as the ability to arm or disarm your system remotely. With the help of a mobile app, you can stay clued-in on your home’s well-being while you’re away. Remote access and control options are available with Frontpoint’s Interactive and Ultimate plans, but not with the Protection plan. SkyControl, provided with all plans, gives users easy access to the company’s mobile app and on-screen video. Free apps for smartphones and tablets give users control from afar on both of Link Interactive’s plans. Mobile access and alerts are available with ADT Pulse® and ADT Pulse + Video Control, but not on the Basic or Basic Wireless packages. All Protect America subscribers can view live video and control their alarm systems from anywhere via smartphone, computer, or tablet. One of the best ways to avoid a break-in is to convince would-be intruders that your home is still actively occupied, even when you’re out of town. And thanks to home automation, pulling that ruse off is easier than ever. You can use smart home tech to remotely schedule lights to turn on and off, creating the impression that you’re doing nothing more exciting than watching TV in your living room. Home automation isn’t just good for making a home look occupied, either. Several smart devices also have practical security functions. A smart thermostat can help prevent pipes from freezing if you’re away during cold weather, for instance, and a smart lock can let you check in to make sure you did lock the front door — even if you’re already at the airport. Frontpoint offers lighting control with its Interactive and Ultimate plans, but not with its two bottom-tier plans. Mobile lighting and appliance control is available with their Smart Control Plan, but not with Vivint Starter or Smart Protect. Smart Control also provides remote door locks. Link Interactive gives users the option to purchase additional equipment to control things like light, temperature, and garage doors. Home automation options are available only in the company’s top-tier plan. Protect America doesn’t currently advertise any home automation solutions in its security packages. It’s not just intruders you need to safeguard your home from while you’re off traveling — you also need to protect it from various elements and natural disasters. And while you could ask your neighbor to stop by regularly to check that everything’s still running smoothly, it’s often easier and safer to leave the job to emergency detectors. Whether you’re worried about floods or fires, home security companies now provide equipment to help you keep your house safe from a host of different disasters. Fire, flood, and carbon monoxide protection is provided with all Frontpoint plans. Smoke detectors are provided with all plans. Users can purchase a Disaster Sensor, which detects smoke, extreme heat, freezing temperatures, and flooding. ADT doesn’t offer any weather-related sensors in its security packages. Users can purchase a Flood Sensor to monitor flood risk remotely. Installing motion sensors is a great way to protect your home in the event of a break-in, but if the sensors are overly sensitive, they may be triggered by a cat or dog. Fortunately, if you prefer to keep your furry friend at home while you travel, you don’t have to compromise on safety — simply install pet-friendly sensors that won’t set off any alarms for animals weighing less than 40 pounds. Frontpoint’s motion sensors are relatively pet-friendly, so most small animals won’t set it off. Vivint’s motion detectors are largely pet-friendly, though they may need sensitivity adjusting for larger animals. Link Interactive offers pet-sensitive motion detectors with both of its monitoring plans. ADT offers — and widely advertises — its Pet Immune Motion Detector, so pets under 40 pounds shouldn’t trigger an alarm. All Protect America plans include pet-friendly motion sensors. There are a variety of monitoring types available, including landline, broadband, and cellular. Landline monitoring requires a phone line to communicate with the monitoring center; broadband monitoring — sometimes called wireless monitoring — requires a Wi-Fi connection; and cellular monitoring uses the same type of 3G networks that cellphones use. While each type of monitoring has its place, cellular monitoring is the best choice for frequent travelers. With landline or wireless monitoring, the connection is subject to outages if phone lines get cut or if Wi-Fi goes out. Cellular monitoring isn’t vulnerable to those types of disruption, making it a great option if you’d like to enjoy your relaxing beach day without worrying about your home Wi-Fi network. All Frontpoint plans use a combination of wireless and cellular technology, providing extra security should one network fail. Vivint’s plans are 100% cellular. Reliable cellular monitoring is standard for all Link Interactive plans. Protect America offers landline, broadband, and cellular monitoring options. Keeping your home safe while you’re away is important. If you’re still not sure which alarm system is right for you, check out our guide on top security systems. With a reliable security system installed, you’ll be able to make the most of your travel, no matter where you’re headed.